How can I set up filters to my report that are dependent on the selection of a parent filter? You can accomplish this through the combined use of Cached Filters and the Filter Dependency Structure. Make sure the filters are listed in order of dependency; this will make it clearer to the user. Leave the filters as User Prompt so they are available for the user. 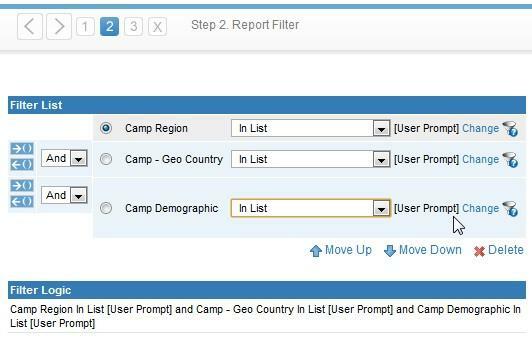 In this example, we’ve used the Camp Region, Camp – Geo Country, and Camp Demographic as filters, all set to In List in order to allow the user to select multiple values if required. On the Report Preview page, click on the Filters menu at the top of the menu ribbon. 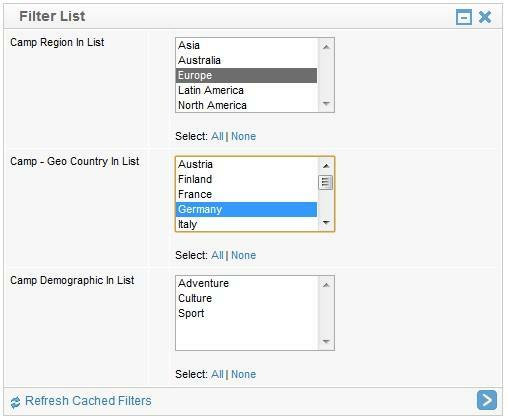 Select the top level filter from the drop down list provided. Open the Entry Style menu, set the Entry Type to Drop-Down, and the values to be Cached Values. 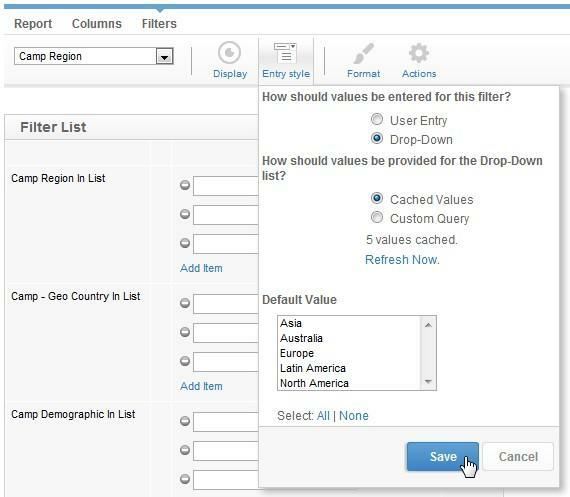 Click Refresh Now to generate a list of values for the filter and Save. 3. Set the second level filter to be dependent on the top. 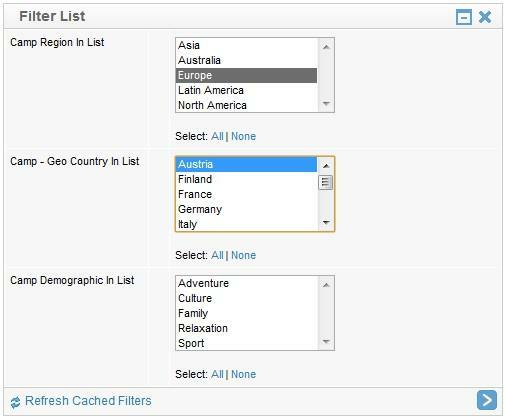 While in the Filters menu on the Report Preview page, select the second level filter from the provided drop down list. Open the Display menu and set the Display Dependant On value to the top level filter. Save. When the dependency and caching is set up correctly, the second filter will be hidden until a value for the first filter has been selected. Each time values for the first filter are changed, the second filter value list should be refreshed. 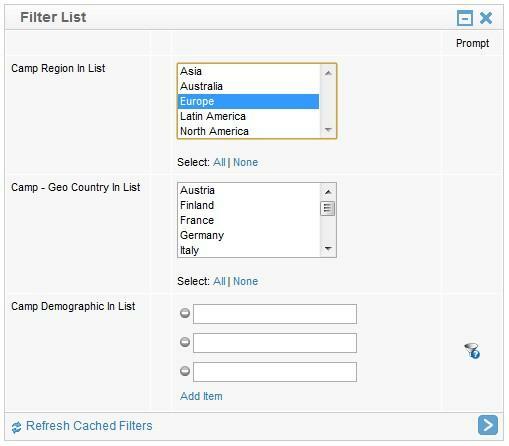 For each of the remaining filter levels, you will need set the dependency to the filter level directly above it, and then cache the filter. 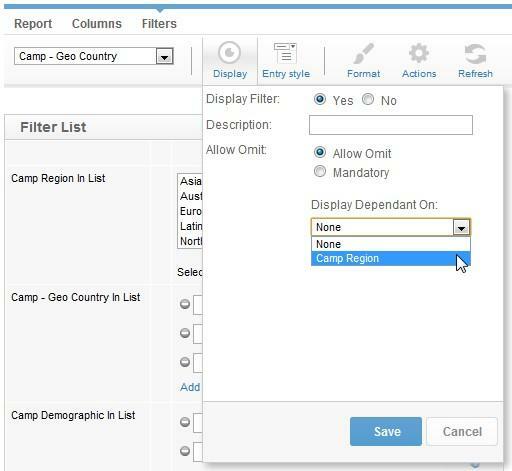 Once you’ve completed these steps, you should have filters available on your report that should display once the level above has a selection, and should refresh when that selection is changed. In this example, you can see that Camps in Austria cover the Adventure, Culture, Family, Relaxation, and Sport camps, whereas the German Camps only cover Adventure, Culture, and Sport.